We invite you to explore India - the Land with infinite beauty ! Whether you soar high into Himalayas or peer under the ruins of the Ancient monuments dotting the landscape of India, you will cherish the experience long after your visit ! This India Travel Guide on Naukuchiatal is free from any commercial interest! This site is dedicated to promote India - the vast subcontinent, its glorious past, magnificent landscape and its infinite variety. 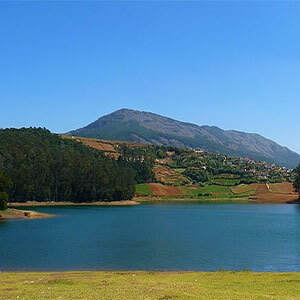 Pleasant weather, pristine lake amidst picturesque mountains in an enchanting valley, dense jungles nearby, exciting activities, irresistible delicacies, an array of attractions lure tourists to visit Naukuchiatal. Being an all-season hill station, Naukuchiatal lets vacationers choose and enjoy what they like most. A relaxing holiday amongst the solitude of mountains, adventure filled exciting holiday or a combination of both, Naukuchiatal suits all. Naukuchiatal is a picturesque hill station in the state of Uttarkhand. It is literally in the lap of the magnificent Kumaon Peaks, part of the majestic Himalayas. The lake is at an altitude of 1,220 meter. At 40.8 meters, it's the deepest lake in Uttarkhand. Nau-kuchia-tal is also referred to as 'lake of nine corners'. Thanks to a perennial underwater spring, the lake is filled with water throughout the year. As per popular beliefs, Naukuchiatal dates back to the times of Mahabharata when Pandavas had come here and to Bhimtal during their exile period. From Delhi, it's only 320 kms and can be accessed by road or rail. The place is part of a holiday itinerary that covers Corbett, Bhimtal (4 kms) and Nainital (26 kms). Most honeymooners would prefer the cozy boat rides in the lake, sit by the lake or go for long stroll. For the few who like to laze during the day and use the built-up energy in activities that bring on the rush of adrenaline, there are indeed plenty of hard-core adventure activities. Enjoy scenic nature: The deep blue lake, 1 km long and 0.5 km wide is by itself a major attraction. At dawn, the beauty of the lake is its best with the entire valley being covered with mist and the mountain slopes covered with frost. Melodious chirps of birds fill the morning sky. The lake is one of the most beautiful and cleanest lakes of Nainital. Sitting along the shores of the lake, you can enjoy panoramic view of the surrounding hills. The pristine lake with its green surroundings offers a splendid opportunity to savor the abundance of flora and fauna. A beautiful tree-lined path which runs along the entire length of the lake would motivate even the slothful to embark on rejuvenating walk. Go boating : The choice is rowing, paddling or yachting. Hire paddle boats and go boating. The quietness of the lake is disturbed occasionally by the splashing of water while rowing. Added attraction is the enchanting views of meadows and pastures in a radius of about 10 kms. Bait the fish: The Lake is a perfect spot for anglers. Fishing in the lake can be relaxing and fun. Get a fishing pole, fishing reel, bait, hooks and a permit from Irrigation department, amateur or skillful; test your fishing skills in the silent Naukuchiatal Lake. Horse riding: If you are proficient horse rider, embark on challenging trails. Even the novice can enjoy smooth rides on select trails. Bird-watching: Yet another recreational activity in Naukuchiatal is bird-watching. The Lake is a perfect place for bird-watching. The fields, farm and oak forests attract large number of rare migratory and Himalayan birds. Bring your binoculars to spot butterflies as well as birds that search for feeds and breed on the lake. Drive up to Pandegaon and try your hand at hang-gliding over Naukuchiatal. Trek through the nearby woody forests, the abode of Himalayan flora and fauna. From the lake as the starting point, many trekking trips to Jandhidhar and Jugliagaon are organized. Feel like a bird. If the sky is clear, with the help of trained pilots, explore and experience thrilling paragliding in the beautiful skies of Naukuchiatal.